The Dreams of Fishermen were Built on Schools of Herring. Herring move along a route which begins in Esashi of southern Hokkaido, and stretches along the coast of the Japan Sea through Suttsu, Otaru, Atsuta and on up to Soya. In each city and town along this coast you can find signboards, which pay tribute to this “Herring Road”. The fishing lodges which stand along route 231 once housed fishermen who came with dreams of great fortune. One can just imagine the energy they brought to this region. 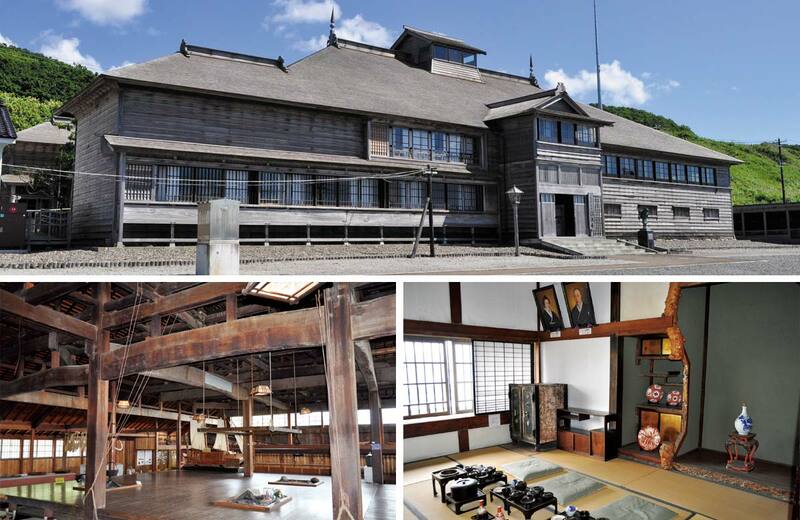 Obira town purchased this lot and the National Cultural Property for 190 million yen. This was done over a period of three years, which ended with a completely renovated facility. The history and culture of the herring boom years continues to be relived at the Roadside Station Obira Banya. This is the interior of the banya, which has 906 square meters of floor space. Most of the lumber used to build it was taken from the mountains nearby. 200 fishermen slept here during the peak fishing season of this large-scale operation. The prosperity of that era can be seen in the high quality of this structure. When we visit this, the Northernmost Nationally Designated Important Cultural Property of Japan, we can imagine the prosperity that came with the herring boom. Kuki is a term used to describe large schools of herring, which swim into the shallows to spawn. The numbers were once so large that the ocean would turn whitish with herring milt. Because they migrate to the Japan Sea coast of Hokkaido from February to March, herring are known as the harbingers of spring. The herring of Hokkaido became well known from the Edo era, and the Meiji era saw a sharp increase in fish hauls. Great fortunes were amassed as owners of fishing vessels and gear came from Honshu and other areas of Hokkaido to set up fishing grounds. Hundreds of workers known as yanshu were employed in each of these operations. Those owners built large lodges known as banya to accommodate their families, businesses and employees. The Hanada Banya, which stands in Obira, is one of the largest of these lodges and is the only such lodge to have been designated as an important cultural property of Japan. Construction on this banya was completed in 1905. Space for the boss and his family was built adjacent to living quarters for the yanshu. The Hanada Banya was built in typical style with a large dining space, which is surrounded by platforms for sleeping. One gets a sense of the prosperity of banya owners through the luxurious style of these buildings. A goten, or “herring palace” is a term used to describe the private mansions built by herring bosses and are not to be confused with the communal living style of banya. This lodge was built on Teuri Island between 1901 and 1902 on. It was once used as a Youth Hostel but now it is not open to the public. This banya is located about 1 kilometer away from the Hanada Banya. It was built at the end of the Meiji era and now houses the Fujita Marine Products shop and business, which is well known for its smoked octopus. This banya stands on National Route 231, about 100 meters south from the Engan Reuke Ikku bus stop. It was built in year 10 of Meiji (1877) and is still used as a private residence. Be advised that this is private property and as such can only be viewed from outside the premises.